The Wanderlust Pinwide is an accessory for Micro Four Thirds cameras that is quite unlike any other. It’s not quite a lens and not quite a body cap, but it’s a fusion of both. 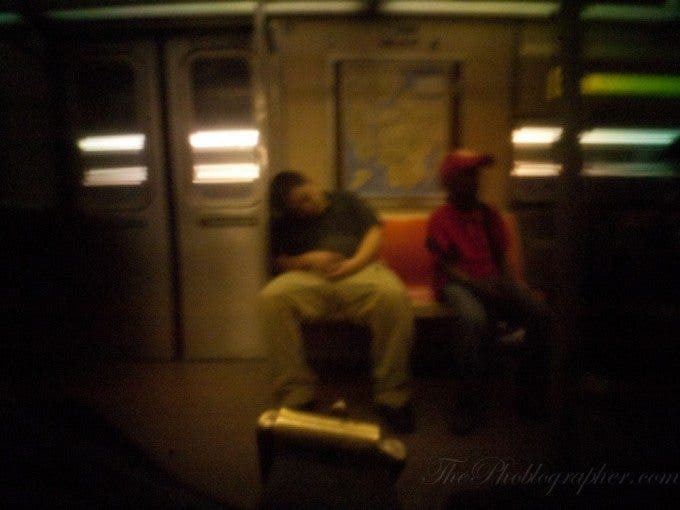 For those of you that are familiar with pinhole photography, you’ll be in for a treat. 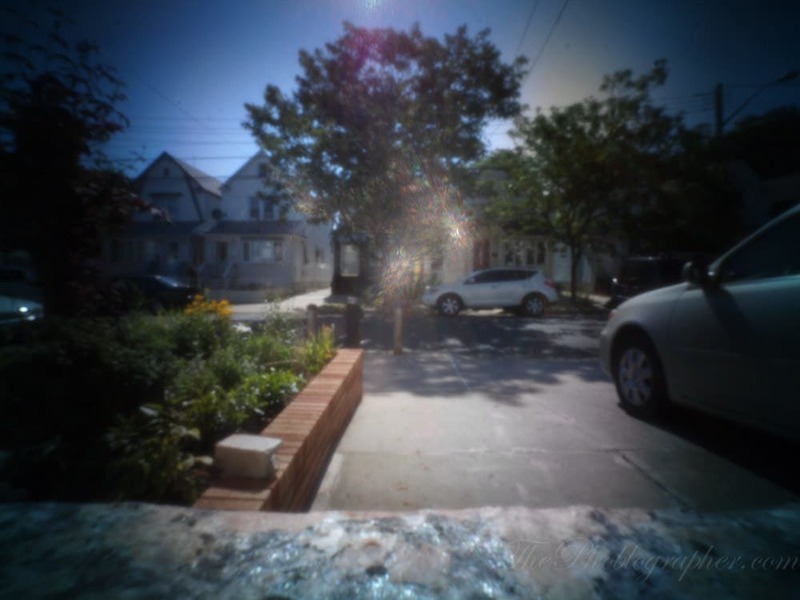 Even if you aren’t, you’ll perhaps become smitten with the sheer amounts of fun that you can have with the Pinwide. With all this said, is it worth the money? 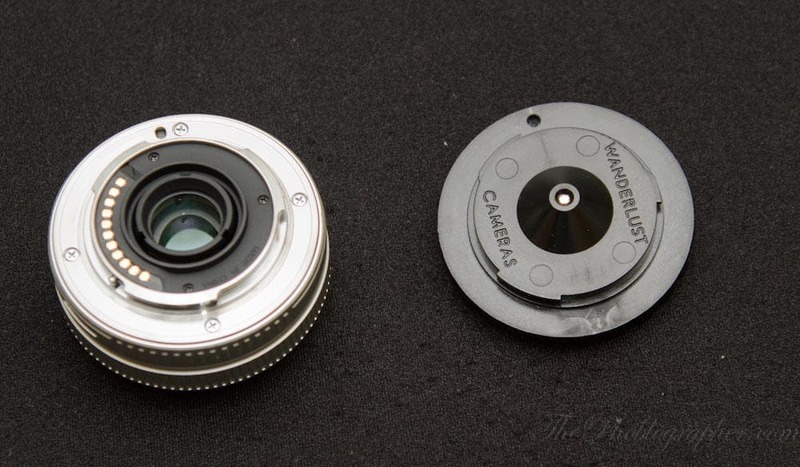 Lens Mount: Compatible with Micro 4/3 cameras, except for the Panasonic AF-100. That means the Olympus EP2 (See all Point & Shoot Digital Cameras) , EP3, Panasonic GF3 , G3 and GH2 (See all Digital SLRs) are all fair game. The Pinwide is a strange optical piece of equipment. If you compare the back of it to a standard Micro Four Thirds lens, you’ll notice that there are no electronics and no moving parts at all. Additionally, it goes deeper into the body than your average lens. In the middle of the Pinwide is a very small optic meant to allow light in for the image to be created. At f128 though, you’ll often need very long exposures. 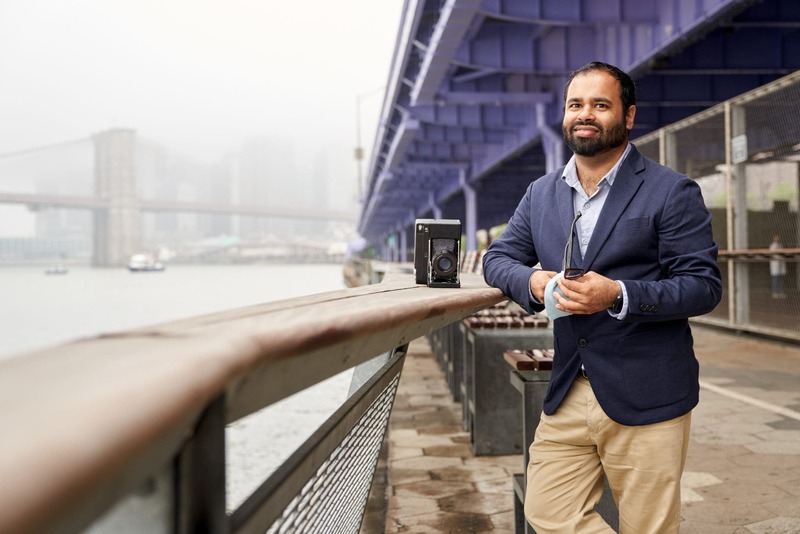 Photographers that have used pinhole cameras before will know that this isn’t news though. Perhaps the most difficult and tedious part about using the pinwide is mounting the darn thing onto your camera. The front has a little W and it may take a little bit of time before one figures out that said W is supposed to go on top of the red dot on the body mount. Then you’re supposed to twist it into place. If you’re a bokeh lover, we will strongly suggest that you look somewhere else. 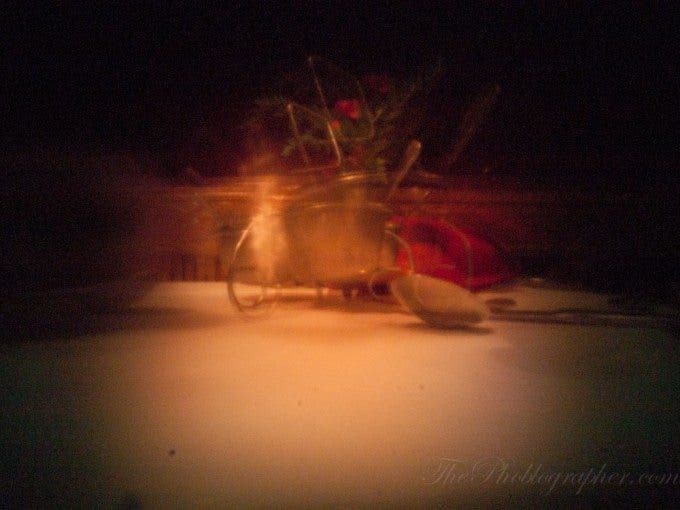 By nature of the lens, in order to get any depth of field perspective to your images with a pinhole camera, one often needs to place one object in front of another. You’ll see that even in the Olympus 12mm f2 review that only when we focused close up did we see any bokeh. And in low light, expect to go for super long shutter speeds of 30 seconds or more. Also, expect to crank up the ISO settings. 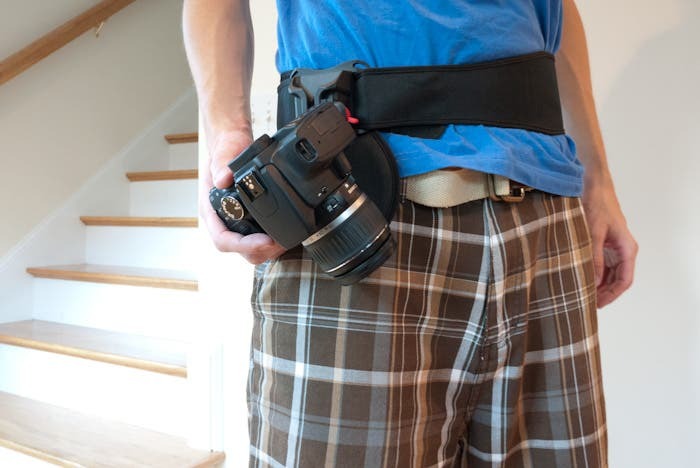 When shooting, you’ll also often need to hold as still as possible. For that, we’d recommend the Vanguard Nivelo tripod we reviewed. 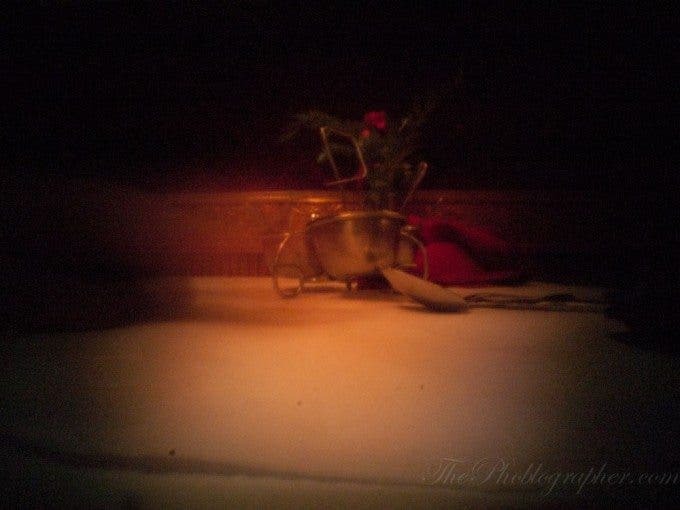 In the photo above, the restaurant server, moved the camera forward a bit and my friend twirled a spoon and walked his fingers through the image. It helped give the image an artistic and creative look. At f128, you’ll also be hard pressed to see any light on the back LCD screen. 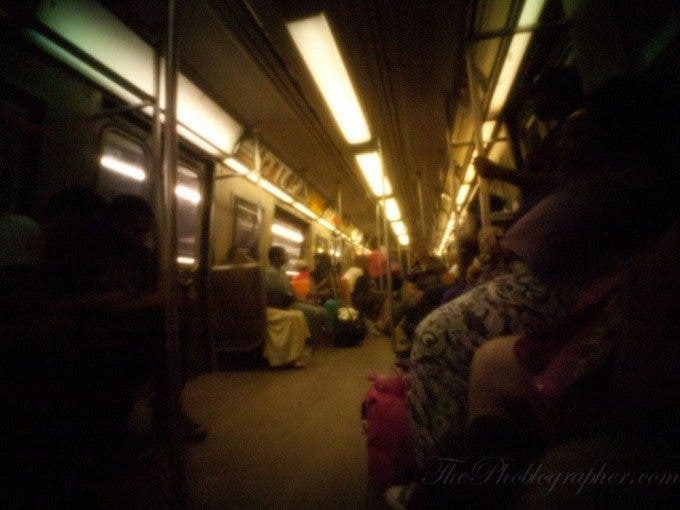 When I shot this image, all I really saw were the lights up top on the back LCD screen. 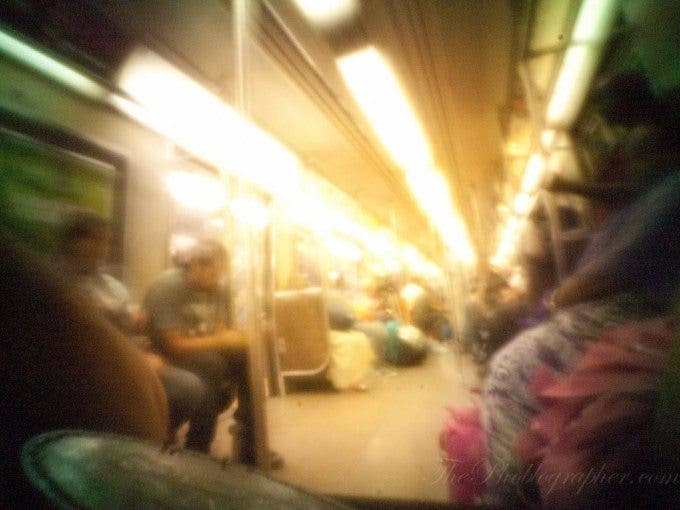 The blur is from the fact that I was on a moving subway train. If you’re trying to capture some tender or candid moments, also try to make sure that your subjects are holding very still. 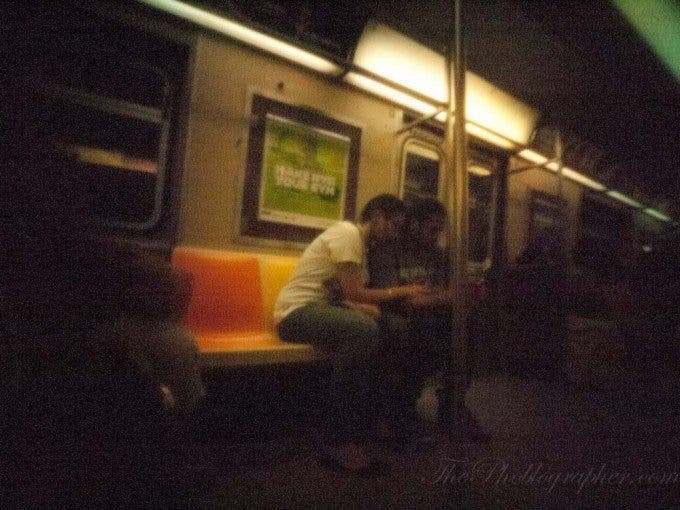 My buddy Gabe over at Ruinism.com often takes photos of us with his pinhole camera, and we have to stay super still. When you move the slightest bit, don’t expect super sharp images either. This is standard for all long exposures. 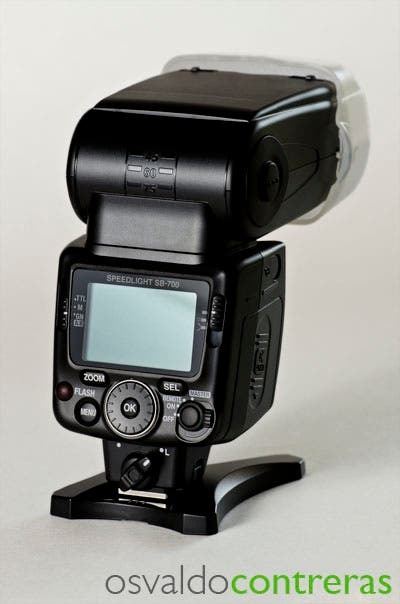 Depending on your exposure time length, you may get more or less vignetting. And make no mistake, the vignetting is heavy. Something that I wish were possible would be if the apertures could be changed. 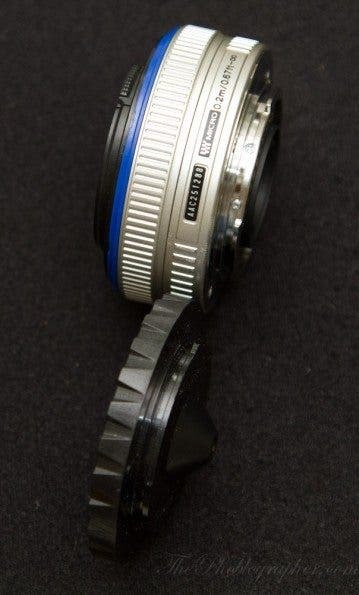 Something like the old Lensbaby design would be very cool. When using the pinwide, I’m happy to say that the color rendering is very life-like. In fact, since I used this on the Olympus EP2, I was shocked because the camera tends to render more towards the cooler side of the spectrum. Do note that anything closest to the camera will also be very sharp. Something like this belongs in the Lomography store. When shooting in bright sunlight, you’ll notice that the center tends to have hot spots. Also make sure that your sensor is clean, spots will surely appear. The hotspot becomes even more apparent if you lower the exposure time. 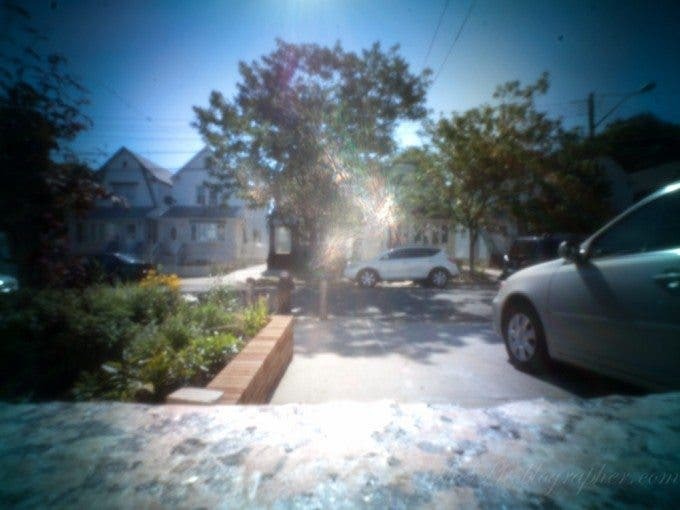 Also, the vignetting is more visible. With the pinwide, you’ll often find that you’re best off throwing the camera’s metering out the window because at f128, you’ll really need to guess. 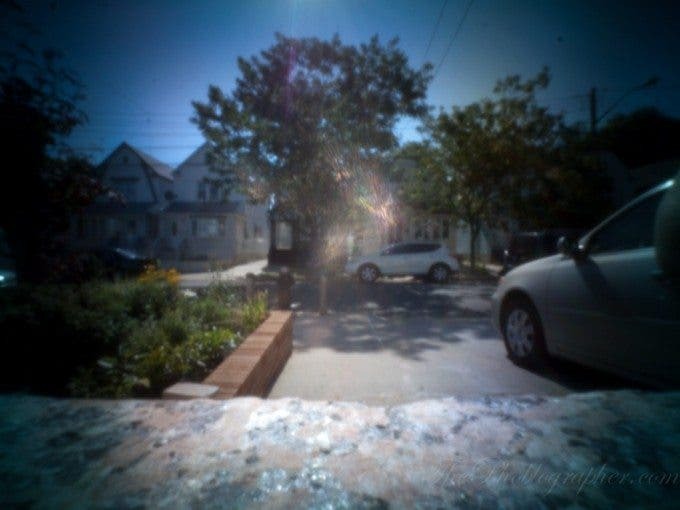 Olympus Micro Four Thirds cameras have their own pinhole art filter. Basically, it seems to heavily vignette the sides. 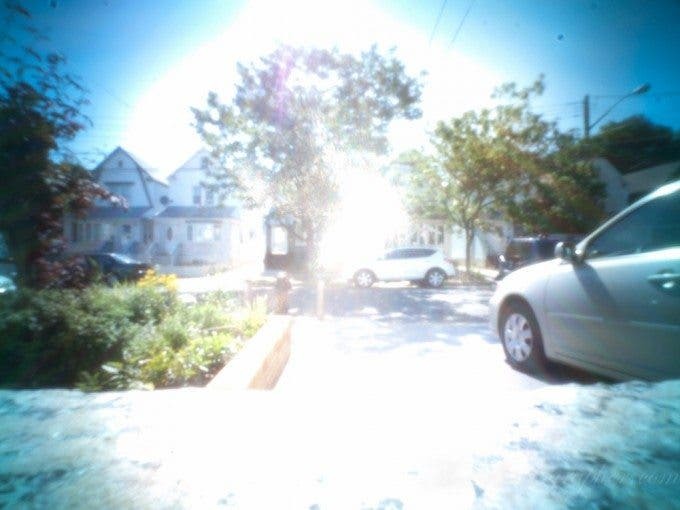 As you can see, the pinwide adapter makes everything seem much more organic and true to what an actual pinhole camera would render. So is the Pinwide worth the money? Sure. It’s cheap, it’s small, and it allows the user to experiment with something new. 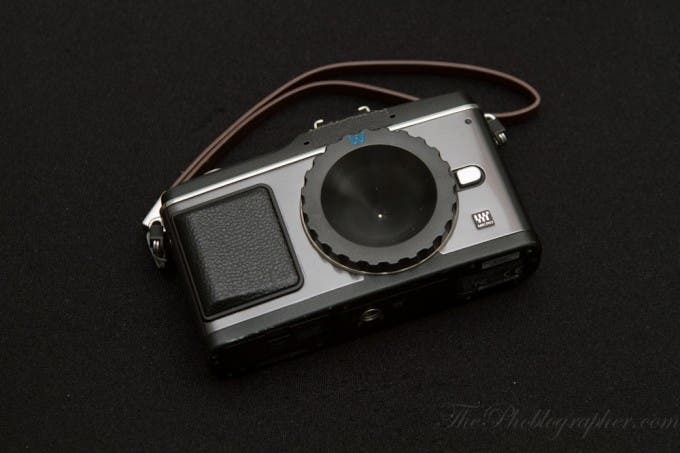 Photographers just getting their feet wet in the world of micro four thirds and veterans from the film days alike will both really digg what the Pinwide can do. Additionally, it comes in its own little tin case for portable storage and carrying. Though more often than not, I’m usually just throwing it into my camera bag without worry. When using the Pinwide, we’d recommend shooting in RAW and if you’d like, tweaking the colors afterward for a crazier and more artsy look. To be fair, none of the images in this posting were tweaked except for being resized for the web. Also, we’d recommend that you pay attention to what the camera’s LCD screen is rendering instead of the meter. 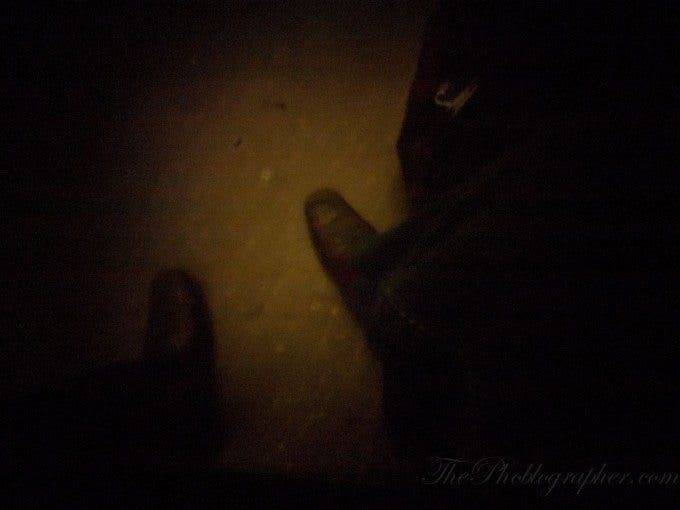 If you see lights of any sort, that will usually mean that the exposure is good enough to take a photo. If not, then consider raising the ISO levels or shooting at a longer exposure time. With that in mind, we also encourage you to shoot only in manual mode. Overall though and after more than a month of use, the Pinwide gets our total recommendation for the Micro Four Thirds photographer looking for something new and exciting on the cheap.